Please type your desired tags, e.g. Economics, Critical Media Studies, Medicinal, STEM Writing, Bionan, Mental Health, Experiential Education, International Development, K-12 Education, Public and School Libraries, History of Medicine, Early American Literature, Culture, Higher education, Translation, and etc. The long-term goal of research in our lab is to use mathematical and statistical methods to identify functional elements in eucaryotic genomes, especially the genes and their control and regulatory elements. A genome is the program book of a life, genome research will lead to eventual decoding of the entire genetic language of life and its grammar. Driven by the Human Genome Project, our current interest is on two related problems: genome/chromatin organization and gene regulation networks. At the transcriptional level, identification of cis-elements (both genetic and epigenetic) is the key focus. We are increasingly interested post-transcriptional regulations, especially at splicing regulation and translational regulation. Constitutive coding exons are relatively easy to identify, the greatest challenge lies in the identification of end exons and alternatively spliced exons that are often tissue- and developmental specific. Since this requires the study of many important control and regulatory elements for gene expression, this link between gene structure and function at the genomic or pre-/pri- RNA level requires high-throughput functional studies. Detecting cis regulatory elements and modeling gene expression networks are difficult challenges in the functional genomics era. Working closely with bench-scientists, our investigation will undoubtedly contribute to the understanding of genome organization as well as gene expression and regulation mechanisms, which will in turn have a profound impact on biology and medicine. Life Technology Training Center, Recombinant DNA Techniques I and II, (Lab.Course Certificate), Mar. and Sept., 1992. SIAM Computational Biology Workshop (Training Certificate), Rutgers University, Aug., 1992. Advanced Automated/Diagnostic DNA Sequencing Workshop, Baylor College of Medicine, Jun., 1993. Molecular Genetics, Cell Biology and Cell Cycle of Fission Yeast Course, CSHL, Nov., 1993. Experimenting on Differential Display (Liang and Pardee,1992) Method by Internal Dye-labeling in David Beach's Lab., 5 months,1994. Advanced Genome Sequence Analysis Course, CSHL, Mar., 1995. Nucleic Acid & Protein Sequence Analysis Workshop, Pittsburgh Supercomputing Center, Jun. 1995. Unix (Solaris 2.5x) system administration certificate from Sun microsystems, 1997. 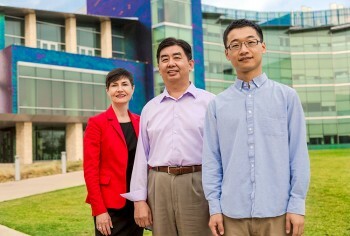 Dr. Michael Zhang, a leading scientist in computational biology and genomic research, has joined UT Dallas as professor and Cecil H. and Ida Green Distinguished Chair of Systems Biology Science. Zhang’s chaired position in the School of Natural Sciences and Mathematics begins establishment of a new Center for Systems Biology. “In attracting a researcher of the stature of Dr. Zhang to our faculty, we expect to nucleate a major effort in genomics and computational biology that focuses on the genetic underpinnings of disease,” said Myron Salamon, dean of the School of Natural Sciences and Mathematics. Computational biology bridges the life sciences and quantitative sciences – mathematics, statistics and computer science – to understand living systems. Bioinformatics (Acting associate editor before 2007, Editorial board member), NAR (Editorial board member), CSHProtocols/BMC Biology/Genomics/Bioinformatics (Associate Editor). JBCB (Editorial board member), Systems and Synthetic Biology (SSB, Editorial board Member), Comparative and Functional Genomics (Editorial Board member), Int. J. Comp. Biolsci. (Board member), JMB, G&D, MCB, Yeast, GENE, Nature Rev. Genet., Nat. Genet., Genetics, Genomics, Genome Biol., BioMed. Central, Plant Mol. Biol., Human Mol. Genet., Computational Biology, Genetics, The Plant Journal, Genomics, J. Sta. Phys., J. Theor. Biol. , Bulletin for Math.Biol, Science, Nature, Nature Technology. Scientific Advisory Board of Cold Spring Harbor Lab Conferences in Asia, 2008-2009 External Scientific Advisory Committee, Max Plank Institute, 2006-2012 External Scientific Advisory Committee, Brown University Genome Center "COBRE" grant. 2004-present. External Scientific Reviewer of the integrated cancer biology Center Grant (P50) at OSU. 2004-present. Chondrongene. 2003. Genome Therapeutics Corp. 2002. Advisor, Yang Ming Medical School, Taipei, Taiwan. Aug. 2001. Vitatex, 2001. SK Corporation, 2000. Tularik Genomics, 1999-present Otsuka Amenrican Pharmaceutical, Inc. 1997-1998. Look4Gene.com 2000. Visiting member at NCBI, NLM/NIH, Sept-Oct, 1995. 2009- Xinxu Chen (Undergrad, Stony Brook U) 2009 summer Aviva Mall (URP student from Cornell U) 2009- Yifan Mo (PhD student, Stony Brook U.) 2009- Jie Wu (PhD student, Stony Brook U) 2008- Longwei Guo (Ph.D. student, Tsinghua U.) 2008 Magdalena Jurkiewicz (MD/PhD student, Stony Brook U.) 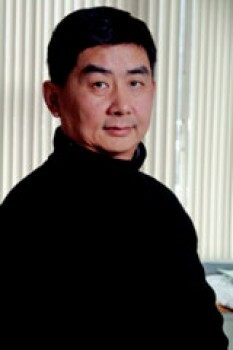 2008- Will Liao (PhD student, Stony Brook U.) 2008 summer Eric Domb (URP, from Princeton U., CS) 2007-2008 Xiaowo Wang, visiting Ph.D. student from Tsinghua U., China. 2007 Hui-Ying Wend (iffive), summer intern from Yang Ming Medical School, Taipei, Taiwan. 2006-2009 Jeffrey Rosenfeld [jeffrey.rosenfeld@gmail.com] (Grad. Student, Biology, NYU) 2005- Fang Fang, Jun Li, Jing Zhang, Shicai Fan, Tingting Li, Bo Jiang, Xi Wang, Xuebing Wu, Xiaowo Wang, Yunzhang Zhu, (MS. And Ph.D. students, Tsinghua U. China) 2005 Vineeta Agarwala (URP-05 from Stanford). 2005 Evan Santo (Rotation graduate student, Watson School of Biological Sciences, Cold Spring Harbor Lab) 2004-2008 Chaolin Zhang (Grad. Student, Biomedical Engineering, SUNY/Stony Brook; now postdoc at Rockeffeler) 2004 Siddharth Srivastava (URP-04 from Columbia) 2003-2004 Yair Benita (Grad. Student, Pharmaceutical Proteomics, Utrecht University, The Netherlands. Now postdoc at Harvard) 2003-2006 Dustin Schones (SUNYSB Ph.D. student from Physics, now postdoc at NIH) 2003 Henry Lin (URP-03 from Harvard) 2003 Chris Maher (SUNY/Stony Brook rotation and Ph.D graduate student from Biomedical Engineering program). 2002-2003 Mamoru Kato (one-year visiting Ph.D. graduate student from U. of Tokyo) 2002-summer Jackie Ou (URP-02 from Duke) 2001 Elaine Shum (PFF high school student) 2001-2002 Zhenwei Zhu (SUNY/Stony Brook rotation and Ph.D. student from BioMedical Engineering Program) 2001-summer Joe Markson (URP'01 student, co-supervised with Josh Huang) 2001-summer Michael Hoffman (URP'2001 from UT) 2000-2001 William Palumbo (High School Student) 2000-2001 Apra Mattoo (High school student) 2000 Johannes (Yogi) Jaeger (Rotation graduate student, Genetics, SUNYSB) 2000 summer Chris Brunson (High school student in NY Academy of Sciences program). 2000 summer Maria Vichnevskaia (URP'00 student) 2000-2004 Nila Banerjee (Ph.D. student, Department of Bioinformatics, George Masson University. Move on as a postdoc at Columbia University Genome Center. Now a research scientist at Philip Research) 2000- Yan Zhang (Ph.D. student, Department of Biomedical Engineering, School of Basic Medicine, Peking Union Medical College) 2000 Elizabeth Thomas (Rotation Graduate Student from Watson School) 2000 Jenny Hizver (SUNY/Stony Brook rotation and Ph.D graduate student from Genetics Program) 1999 Adriano Costa de Alcantara (URP-99 student, went back to Brazil) 1998-1999 Brain Chang, Junior-Senior, Dept. of Molecular Biology, Harvard University (Thesis advisor: Tom Maniatis). 1997 Robert Klein, Senior, Dept. of Molecular Biology, Harvard University (Thesis advicor: Walter Gilbert) (went onto graduate student at Wash. U.) 1996-1997 Tim Chem, Ph.D., Dept. of Computer Science, SUNY at Stony Brook (Thesis advisor: Steve Skiena). (went onto Harvard Med. School as a postdoc in George Church's Lab. He became a faculty member at USC in 2000.). 1996 Will Orrick, Ph.D. Dept. of Physics, SUNY at Stony Brook (Thesis advisor: Barry McCoy). (went onto Australia for a postdoctoral position).